Russ and Cynthia Cashin, founders of Free Spirit Community, are inspirational and masterful spiritual leaders, teachers, musicians and speakers. Russ has been a student and teacher of spirituality for most of his life, having studied Jewish Mysticism (Kabbalah) for over 10 years with several prominent Jewish wisdom teachers. He has also studied directly with some of the most well-known contemporary spiritual teachers of the 21st Century. 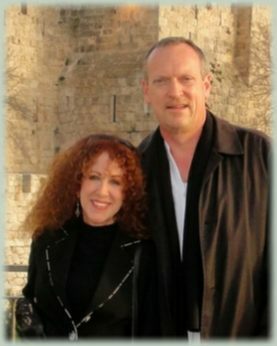 Russ is an ordained Spiritual Minister and Teacher having received his ordination as a Jewish Itinerant Preacher (known as a Maggid) in 2009, along with two additional ordinations as a non-denominational Minister. He is an accomplished singer and performer, and a captivating speaker. Russ also brings to the Free Spirit Community his degrees in Psychology, studies in Human Nutrition, as well as Certifications in Rational Living Therapy and Grief Recovery. Cynthia is a lifetime student of personal development and spirituality, former Prayer Chaplain Coordinator of Unity Fort Lauderdale, Florida and a student of New Thought for decades. Her spiritual beliefs are eclectic and evolving. She is a practitioner and teacher of a variety of forms of meditation, holistic living and Self-Love techniques for many years. Cynthia is a former family law attorney and certified family law mediator. In her over 30 year law practice she has helped hundreds of people to peacefully and positively resolve their disputes. Cynthia is a dynamic, inspirational and entertaining speaker and musician. She brings her life-long practice and teachings of personal development, spirituality, communication skills and musical talent to uplift, inspire and support the members of Free Spirit Community.